The picture on the right shows the typical layout of intake and derivation structures of a Hydropower scheme on the Peruvian Andes (San Gaban II, Physical Model). A small diversion dam, made up of a mobile (gated) spillway and a fixed (weir) spillway, diverts a portion of the river's water flow into the intake. 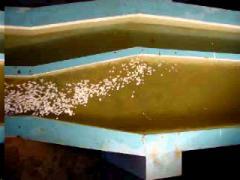 Since the diverted water carries large amounts of sand in suspension, a sand trap is used to force the sand to settle. The sand retained in the sand trap is later flushed back to the river. In the picture shown, a small storage reservoir also is included for hourly regulation of the hydropower station. Designing a water intake on a steep stream on the Andes Mountains is a very challenging problem. Sediment transport in very intense, and if not properly designed the structure could be subject to sediment deposition and intense wear. 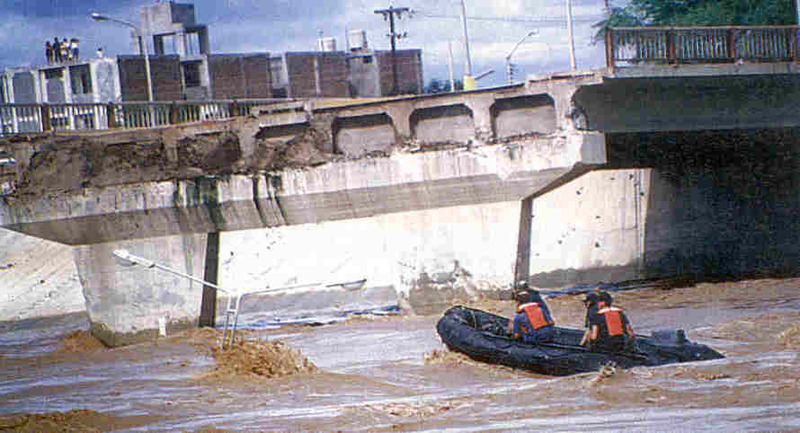 The picture shows the enormous scour hole produced in the base of the central pier that supports the radial gates of Chavimochic's diversion dam. An extremely intensive horseshoe vortex (similar to the ones produced in bridge piers) induced by velocities in excess to 10 m/s, added to high sediment concentration, erodes the base of the pier. 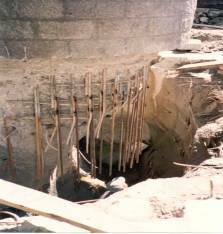 A protective revetment of stones over the reinforced concrete proved useless to avoid abrasion. Another serious problem is the sediment diverted towards the intake. The intake of water usually requires some diversion angle that may induce re-circulation zones (vortices), where the sediment is prone to be deposited. This deposited sediment may block the entrance of water. Streamlining the inlet is imperative to eliminate re-circulation zones. A 2D numerical model is used to show that effect in 60 degrees diversion on a hypothetical intake. Initially, a sharp entrance induces the formation of a vortex that reduced the flow into the diversion channel. When the entrance is rounded, the vortex is eliminated and the intake flow increases by 20%. Intake structures must be designed to avoid the entrance of coarse bedload material into the diversion channel. But they cannot prevent suspended sediment from entering into the diversion channel, that is the job of the sand trap. A sand trap works based on the fact that suspended sediment tend to settle when the flow velocity is low enough, therefore a sand trap requires an expansion of the cross sectional area in order to decrease flow velocity. 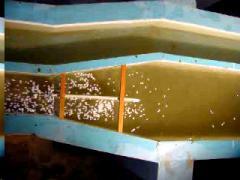 A typical sand trap may comprise many sedimentation canals (7 in Chavimochi's sand trap model shown below). 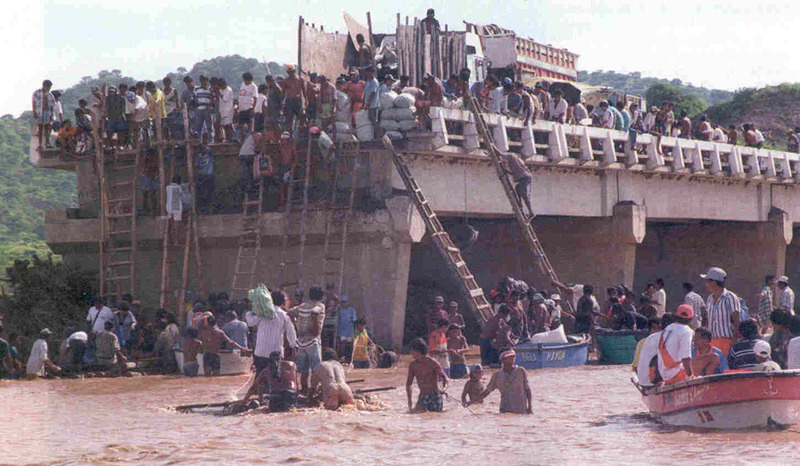 Once a sedimentation canal is full of sediment, a bottom gate is opened and the sediment is flushed back to the river by the action of fast flowing water. A sand trap should be located immediately after the intake (as was shown in San Gaban II), but topographic or geotechnical reasons may prevent that, forcing the sand trap to be located in the diversion channel. In such cases an expansion from the narrow channel to the wide sand trap is necessary. That expansion tends to induce asymmetrical flow in the sand trap with detrimental consequence for its efficiency. 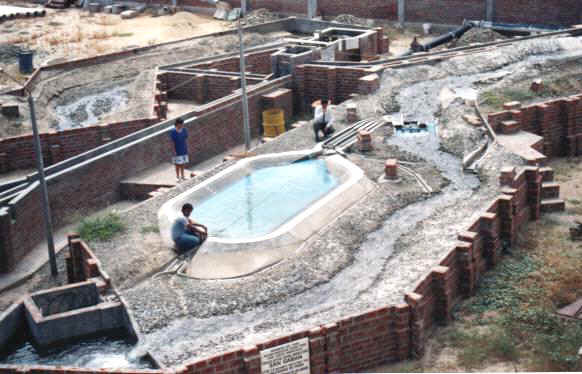 A very good example is the 4-canal Majes Sand trap built in Southern Peru. During its initial operation as originally design, water flowed downstream through 2 of the 4 canals, in one canal the water remained almost stagnant and in the other canal the water was returning and flowing upstream!. The complex 3D flow pattern in Majes sand trap was successfully reproduced using SSIIM, a 3D CFD model, as shown in the vector plot below. It is possible to observe the vectors pointing upstream in one of the canals. This macrovortex and asymmetric flow pattern was eliminated in the physical model by extending upstream -into the expansion- the dividing walls between the canals. The CFD model was also able of reproducing that solution. The color rendering below shows the numerical solution before and after the modifications. It shows the asymmetric velocity concentration on one side (green color) becomes symmetrical after introducing dividing walls in the expansion. 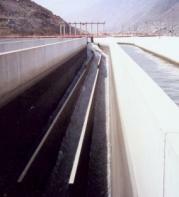 Quiroz is a small hydropower scheme located in Northern Peru. 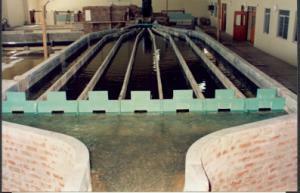 It has a small single canal sand trap, whose apparent simplicity may be deceiving, since a complex asymmetric flow pattern also develops here. The photographs show the traces of floating paper concentrated in one side (see video of assymetric flow ). When a dividing wall is introduced into the expansion the flow becomes symmetrical (see video of symmetric flow). Quiroz physical model sand trap: (a) Initial condition with asymmetrical flow (b) Symmetrical flow after a dividing wall is introduced into the expansion. SSIIM was also applied to simualte Quiroz sand trap, and the results compared against the physical model results (Juan Atoche, 2001). The CFD model was able to correctly simulate the flow patterns of the initial design (assymeytical flow), and the symmetrical flow after the dividing wall was introduced (the wall is depicted as a short red line in the middle). A detailed comparison of velocity profiles for the initial condition is found below. The red crosses are measurements in the physical model and the black lines are the CFD results. These results show that the conventional assumption of logarithmic velocity profile does not hold in this case (in vertical C, flow is moving upstream). Although the complexity of the flow pattern, the CFD model gave very good quantitative results and proves its applicability as a design tool.